A Table in the Tarn, written by Orlando Murrin, is the story of two guys who left London to take up residency in an old manor house in Southwest France, turning the stately building into a charming bed-and-breakfast that is apparently a gastronomic destination. Part memoir and part how-to, the book contains numerous terrific recipes, including this one for rosemary pine nut cookies. I tweaked the recipe (and rewrote it) but the basics are all here. On another occasion, I will substitute lemon zest for the ground ginger. I will also use regular granulated sugar instead of superfine, which Murrin called for, since I thought the cookies didn’t need to be quite so sweet. What attracted me to the recipe was the possibility of developing a savory biscuit based on this, and I think it will eventually work. In the meanwhile, these are easy to make. I threw them together on a weeknight while I was preparing dinner on top of the stove to stop my husband from lamenting about the cookies that he accidentally left behind in the store. Preheat the oven to 325 degrees. Line two baking sheets with parchment. Beat the butter and sugar until light and fluffy and add the olive oil. Slowly add the flour, stirring to combine. Combine the cream and egg yolk and stir into the batter, mixing well. Shape the dough into ¾-inch balls and place 1½ inches apart on the baking sheet (they will spread). Sprinkle with sugar. Bake for 13 minutes or until the edges are lightly browned. 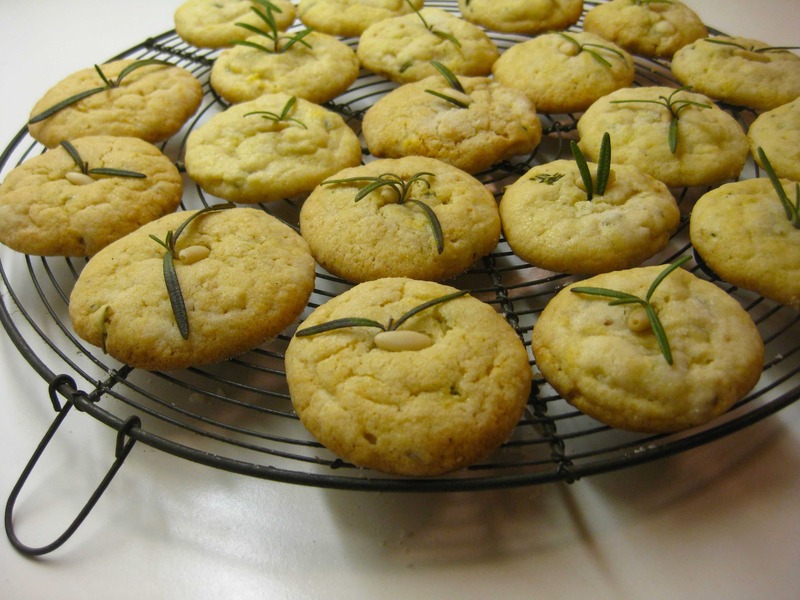 Remove and decorate with pine nuts and rosemary sprigs, Makes 3 dozen.